Designed for production use in the field—and boasting a powerful feature set even by the standard of Sound Devices—the Scorpio is a 32-channel, 36-track, Dante-enabled portable field mixer and recorder with a panoply of connections. 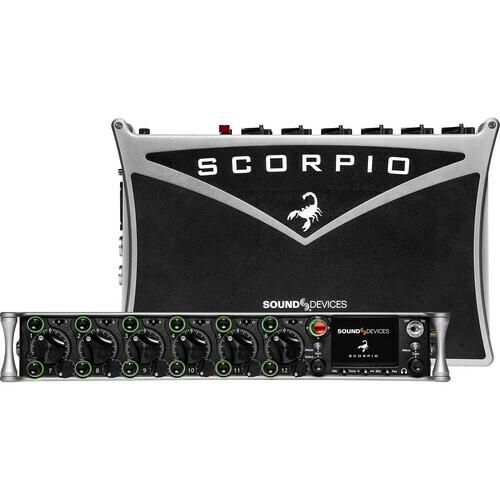 Indeed, the Scorpio is the flagship sound-recording device in Sound Devices' production line. 16 high-quality, low-noise preamps are on-hand right from the device, accepting inputs over XLR, TA3, and TA5 connections. These preamps outperform all previous Sound Devices pres by any measurable spec. All of them provide 3-band EQs, analog limiting, high-pass filters, adjustable delays, and phantom power. Need 32 channels of Dante in and out? The Scorpio is equipped for that. It also handles AES I/O and gives you 12 analog outputs. Multiple headphone outs are on hand to suit any kind of situation. Even communication headsets can be accommodated. Use the Scorpio to mix up to 12 individual buses, all in a compact form factor that works equally well in an over-the-shoulder rig or a mobile environment. 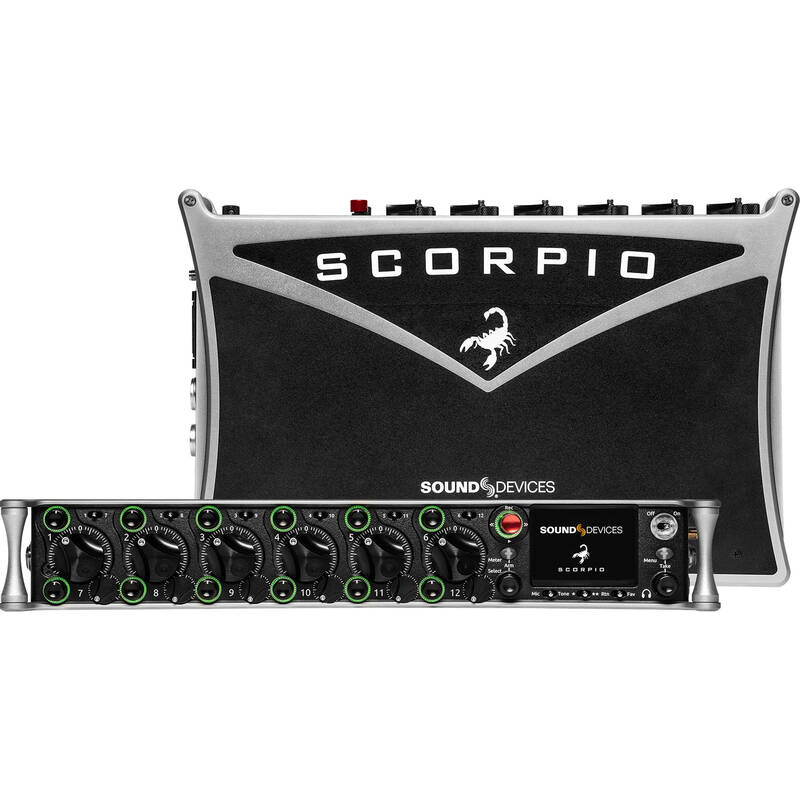 With an onboard engine that makes use of three FGPA circuits and six ARM processors, the Scorpio can handle complex routing schemes, pushing audio through its 64-bit engine to ensure a high-quality sound for your demanding, in-the-field needs. The Scorpio boasts a 256 GB internal SSD for recording audio straight to the device, though two SD card slots are on hand for redundancy. Simultaneous recording is supported—though that of course might be redundant to say. The accurate, onboard timecode generator boasts its own battery to hold timecode for up to four hours after you power off the device. The device was built to be as ergonomic as it is powerful, offering you one- or two-button accessibility to most menu options, and one-handed control over many menu shortcuts. Power the mixer with L-mount batteries, or use the TA4 DC inputs with smart batteries, inline power supplies, or NP-1 batteries. This Sound Devices' sound device even gives you a built-in dual L-mount battery charger. Scorpio supports the ubiquitous MCU (Mackie Control Universal) protocol which many USB-connected control surfaces use. At launch, the iCON Platform M+ (along with D2 Display) is supported.